MOTORHEAD - NO SLEEP 'TIL HAMMERSMITH DELUXE EDIT. (2CD DIGI) | Online Shop | Wizard LTD. Album: "NO SLEEP 'TIL HAMMERSMITH DELUXE EDIT. 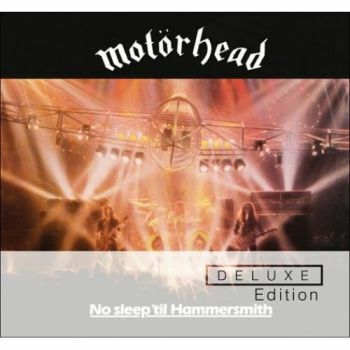 (2CD DIGI)"
MOTORHEAD No Sleep &apos;Til Hammersmith (2009 issue UK &apos;Deluxe Edition&apos; 2-CD album set - Originally released on 27 June 1981, &apos;No Sleep &apos;til Hammersmith&apos; was Motörhead&apos;s first live album, and with the exception of &apos;Iron Horse / Born To Lose&apos; [which was from a 1980 show], it was recorded at the Leeds & Newcastle shows during the &apos;Short, Sharp Pain In The Neck&apos; five-date tour in 1981. This deluxe edition comes complete with a Bonus CD including an 11-track collection of live outtakesfrom the tour. ).